At 63, Tej Razdan is old enough to remember what Lake Pichola used to look like. "With so many ghats [steps] and temples lining the lake, and buildings limited to single-story development, it was more beautiful even than along the Ganges in Benares," Razdan, a surgeon who lives in Udaipur, Rajasthan, says. "To see it now, I am weeping. That is the pain in me." Lake Pichola, a 4.3-sq.-mi. lake in Udaipur, could go the way of the cheetah and other endangered wonders in India unless someone finds a way to put the brakes on its long list of misfortunes. Inadequate sewage systems, overgrowth of hyacinths, industrial waste pollution, deforestation and heavy lakeshore development have left the lake with plastic bottles and other debris lining its once pristine edges. Back in the day  that day being some 425 years ago  Udaipur's system of lake development was considered a role model of water management. As early as 1582, the Maharanas of the erstwhile state of Mewar started dredging out Lake Pichola to make it suitable as an irrigation and drinking source for the general population. In 1890, Maharana Fateh Singh inaugurated a project that geography professor Narpat Singh Rathore of Udaipur's Mohanlal Sukhadia University calls the "the world's first man-made microsystem of river diversion, linkage and watershed management," the result of which constitutes the current system of eight interconnected and gradually descending lakes. But the lakes  which earned Udaipur the nickname the "Venice of the East"  have been a major tourist magnet in the past few years, and building places for tourists to sleep has accelerated the problem. With the Oberoi Udaivilas luxury hotel opening in 2000 and the Leela Palace, which opened in April, both just a few feet from the lake, the doors have opened for other shoreline hotel and residential development. "The big guys essentially bought their way past standing lakeshore-encroachment laws," says Razdan. "That created a domino effect. Smaller entrepreneurs with money muscle and political connections asked, 'Why not us too?' "
Getting lake-conservation measures on the books has been slow to nonexistent. 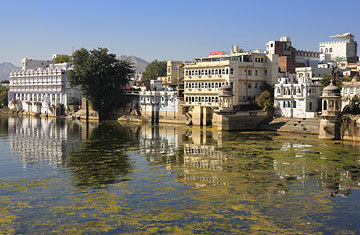 In the absence of effective public management, some 14 local environmental groups have been working in different ways to preserve the waters; a few have even filed lawsuits against local and state governing boards seeking urgent judicial intervention to clean up Udaipur's lakes and check the flow of pollutants into these water bodies. Following up on suits that began in 1982, the state's high court directed the government in 2007 to consider establishing a Lakes Development Authority, implement a "no-construction zone," undertake continuous de-silting steps and other restrictive measures. Two years later, none of the court's directives have been implemented. "There's too much political finger-pointing and not enough problem solving," says Arvind Singh Mewar, whose ancestors built the lake system and who now heads HRH Hotels, a chain of 12 heritage properties, including five in Udaipur, converted from family palaces and hunting lodges. "Like my forefathers, I feel it's my responsibility to bring us together to take action quickly or lose our greatest asset, both environmentally and economically." Concerned citizens like Mewar and Razdan say that it's mostly through their efforts that some improvements have been made over the past 20 years. "Previously there were 100 latrines hanging directly over the lakes," says Razdan, an environmental enthusiast who heads Udaipur's Lake Conservation Society. Until six years ago, 25 tons of solid waste and 6 million liters of raw sewage were dumped into the lakes each day. Now, he says, those numbers have been reduced by 60%. But the local government has made an impact too: a drainage system, built by Udaipur's Urban Improvement Trust (a district regulatory body) and the Rajasthan government's Public Health Engineering Department, now diverts sewage downstream, though a treatment plant has yet to be installed. The area's huge tourist potential could also be part of a solution. In July, Udaipur earned the "world's best city" rating in a Travel & Leisure poll. Last year 1.2 million tourists visited the city; Rajasthan officials estimate tourism here jumped 10% last year. But when water levels drop so low that you can drive a jeep to the two hotels that are built in the middle of the lake  as they did as recently as July  so does the appeal of the destination. Deforestation around the lakes disrupts the flow of water, and waste dumping has caused "hot spots" that dry up underground water supplies. These ideas and others were addressed last month at a one-day conference exploring integrated lake-basin management for the Udaipur lakes, hosted by Mewar at his Fateh Prakash Hotel beside Lake Pichola. Masahisa Nakamura, director of the Center for Sustainability and Environment at Japan's Shiga University and chairman of the International Lake Environment Committee Foundation's scientific committee, identified several human factors that are to blame for the lakes' sorry state: deforestation, construction of new hotels and private homes too close to the lakes, sewage and waste dumping, and poor governance, bribes and corruption. Nakamura was particularly critical of regional marble-cutting industries that dump white sludge, a waste powder made of calcium carbonate and other impurities from the marble. Some 100 factories in the area leave large tracts of the white stuff, which not only contaminate the air, the ground and eventually the waters, but also cause the huge areas of white to reflect the sunlight, creating their own micro-climatic-warming effect in the valleys of the Aravalli Range that form the basin of Udaipur. Nakamura advised governing bodies to impose tighter regulatory laws, better policed with punitive damages immune to bribes and payoffs that have become such standard operating procedure that developers build the expense into their budgets. He also promoted environmental-impact education programs, not only for politicians and influential private-sector citizens, but also the general population of the city (pop. 5.5 million). "As the problem has been caused by the confluence of many factors, so too must the solution be approached holistically," Nakamura said. "We need to also involve people's body and soul, heart and mind."